Learn about six major model codes and rating systems that communities can use to develop green building programs and revise building ordinances. 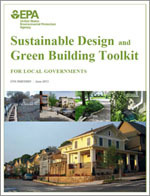 The Sustainable Design and Green Building Toolkit for Local Governments (PDF) (110 pp, 1.12MB, About PDF) helps local governments identify and remove barriers to sustainable design and green building in existing codes and ordinances. The toolkit includes an Assessment Tool in Excel (XLSX) (184K) that local governments can use to evaluate their codes and ordinances; instructions appear on the opening tab.